Visualize this non-recessionary scenario: You've just finished a lavish business dinner at a top-tier restaurant, and the tab was $750. The wine, a trophy bottle, made up $500 of that toll. Do you tip a full 20 percent on the entire amount? Or tip in full on the meal but add only a reduced percentage for the wine? In other words, is it reasonable to be expected to tip the same percentage as for food, especially when you selected an unusually expensive wine to go with the meal? As you might imagine, there's no dearth of opinions on the topic, particularly since tipping customs vary widely around the world, and many diners in Europe, Down Under and in West Asia are bemused by the American practice of expecting diners to supplement an intentionally low wage for restaurant service. One argument goes that you can afford a $500 bottle and the server almost certainly cannot, so it's a matter of simple graciousness to tip the server well. A variation on this suggests that a sommelier who offered you the advantage of painstakingly earned skill and knowledgeable advice earns a gratuity as much as the server who attended to the smooth pacing and service of your meal and the service staff that helped make that happen. On the other side - and it's certainly a discussion with more than one side - there's the argument that the sommelier or server undertakes no greater effort in opening and serving a $500 wine than a $15 bottle, so a sliding tipping scale based on the price tag makes no sense. And a few, of course, excoriate the entire practice of tipping and resist it by tipping poorly or not at all. To that argument I would gently respond that failure to tip merely penalizes the working stiff at the bottom of the totem pole, who is in no position to change the system and shouldn't be punished for it. If one feels that strongly about sending a message, it's more appropriate to send it to management by avoiding dining out altogether. The debate, happily an entirely civil discussion, has been going on all week in all our social media, and I invite Wine Advisor readers to join in the conversation. You'll find this discussion in our WineLovers Discussion Group, on my Louisville Restaurants Forum at LouisvilleHotBytes.com, and on my Facebook page. It's an argument with at least two sides. Please keep it civil, and please try to keep the discussion on the specific question of "proper" tipping behavior for expensive wine. The merits of the tipping practice in general offer a good topic for another debate, but not this one. Also, please remember that you'll need to register in our forums or "friend" me on Facebook if you wish to participate. Registration in the forums is free and easy; I ask only that you join following our Real Names Real Format system, using your real name in the format "John Doe" or "John D". Anonymous, cryptic or first-name-only registrations are discarded without notice. For even more opinions on today's topic, here is an extended discussion on a professional wine-and-hospitality site. For still more, food writer Frank Bruni took on the topic in The New York Times Diner's Journal blog, "The Answer Man: Tipping on Wine," in 2008. Enough talk about wine ... let's taste some! Today's tasting report features a delicious and food-friendly Northwestern Italian white, Roero Arneis, from Piemonte. You'll find my tasting notes below. FOOD MATCH: Good with seafood and fish, a good pick with flavorful or spicy fare. It was fine with risotto with robust alla puttanesca flavors: Browned onions and garlic, sun-dried tomatoes and anchovies, olive oil and Pecorino Romano cheese. VALUE: Prices on Wine-Searcher.com range from $14 to $21; best, obviously, at the lower end of this range, although I was satisfied with its value at my relatively pricey local toll. Roero Arneis = "Ro-eh-ro Ahr-nay'ss"
WEB LINK: Here is the U.S. importer's English-language fact sheet on Correggia 2009 Roero Arneis, and here is an info sheet about the winery. 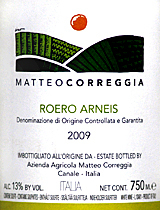 Compare prices and find online sources for Matteo Correggia 2009 Roero Arneis on Wine-Searcher.com. Click here for information about distributors in the U.S. and worldwide.